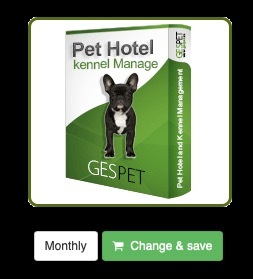 How to change the payment method in Gespet? Paypal: reate a Paypal subscription to pay for your software every month. Every month Paypal will automatically charge the payment in your Paypal account, you do not have to do anything. In the software that you want to change the mode, click on the green button "Change and save"
We'll update your software to have the new monthly payment and we'll notify you once the change is made. In both cases, all information is maintained, nothing is lost. You won't see any difference when working with your software. Remember that in the case of annual payment, you benefit from a discount of more than 20% in your payment. Do you want to change the Paypal account in which you have created the subscription? Paypal does not allow you to change a subscription that you have created with one paypal account to a different paypal account. For example, if you have created the subscription with your personal account and now you want to change it to your company account, it is not possible to do it directly. Paypal does not allow you to do that. This is a Paypal restriction. Access to your "old" Paypal account and cancel the old subscription. All the information stored in your software is maintained, nothing is lost. Purchase the software on a monthly basis with your "Company" account. A subscription is created for your "Company" account. Login in Paypal with your "Personal" account (the old one) and cancel the subscription. Your software is now under your Paypal "Company" account instead of your "Personal" one. In your Paypal account you have a card associated. Do you want to change it? Do you want to update the card information? Select the card you want to modify or delete, add a new card or whatever you need. Do you have a monthly subscription and want to unsuscribe an software? When we receive notification of the cancellation, your software will be canceled, but it will remain active and you will be able to use it until the expiration date. If you have created a subscription in Paypal to pay monthly, the subscription is for several software (for example cria + tienda + hotel) and you want to stop using any of them (for example hotel) , Paypal does not allow you to modify the subscriptions, so you must cancel it and create a new one. Buy now the software you want. You can buy annual or monthly, as you prefer. Are data deleted when I unsubscribe an software? After 30 days from the expiration date, the data stored in your software will be completely deleted and later we will not be able to recover it. During those 30 days, if you wish, you can buy your software again, keeping the data. That is, if your software expires on March 10, you can buy your software again until April 10 and your data will be kept; But if you buy for example in May, the database will be empty, because it is deleted 30 days after the expiration date. If you have any doubt, ask us and we will be happy to help you.